House in a quiet neighborhood with many mature trees. Two bedrooms, one bathroom, kitchen and living room on main floor, basement has TV room and ping-pong table. There is also a bed in the upstairs landing area. Big yard, both a front and back porch. Two blocks to shopping area with a grocery store, coffee shops, liquor store and restaurants. Three blocks to a city recreation center, Boulder's downtown is a 6-8 blocks to the south. El Dora Ski area is a 35 minute drive to the west. Wifi, limited cable TV, big collection of movies included. My wife and I were married in Estes Park and have lived in Boulder for 32 years. We moved to this house 28 years ago and raised our two children here. The house and location have been perfect for us (that's why we've never moved). Now our kids are out of the house. I grew up in the San Francisco Bay Area and my wife grow up in Illinois. We both enjoy the sun and outdoor living that Colorado offers. My wife is a teacher and I am a market research analyst. We love the location of our home. It is in a quiet relaxing neighborhood, yet close to everything. We are two blocks from a grocery store, a liquor store, a coffee shop and three restaurants and only 6 blocks from downtown Boulder. We ride bikes anywhere throughout Boulder using Boulder's great system of bike paths. There is so much to do in Boulder. Concerts, outdoor festivals, plays, and sporting events are all year round. Great views of the Flatrions and mountains. Central location. Wildlife in the neighborhood includes birds, deer, rabbits, squirrels, fox and raccoons. 7 blocks south, nice quiet walk. The cool summer nights make it so air conditioning is rarely needed but there is a window unit if needed. Plenty of parking in the driveway or on the street. Full Rec Center 2 blocks north; ~$5 for a full day pass. French doors and a pull out freezer. Typical coffee maker, and Keurig, plus a French press. Basic items such as flour, salt, sugar, oil, ketchup and mustard. We have a local ski resort just a 40 minute drive west of Boulder. It's perfect for children and families. 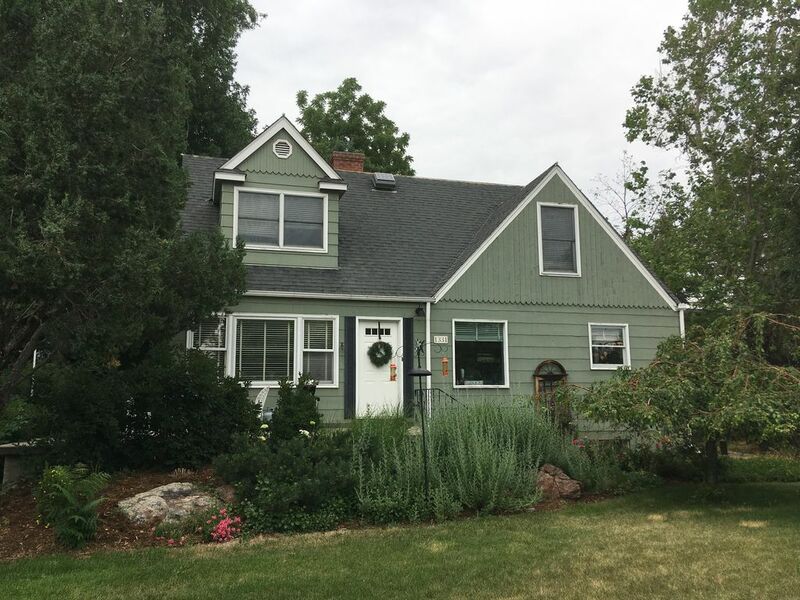 This house is very well located for travel on foot to restaurants, shopping, hiking in foothills, parks - even Pearl Street downtown. It is light, bright and clean with thoughtful touches. The ping pong table was a huge hit, the dart board, videos and comfortable furnishings made our visit easy to entertain our several generations of family who live in Boulder. Old Boulder is a great part of town and we all had a fun time. Thank you for your kind words. Hope you come back soon! The house is in a quiet neighborhood within walking distance of the center of Boulder and the shuttle for good hiking. Ed was quick to respond to all our needs (needed to drop off our bags a little early). Coffee outside on the patio and sitting in the sun is a great way to start the day. The house is clean and served all our needs. Thanks to Ed for making our stay enjoyable. Everything you need SO close to Pearl. This house was a fantastic find. Ed was wonderful in working with me leading up to the trip and in his communication. And the house itself is fabulous. If you're visiting Boulder and want to be close to Pearl and the river, this is it. Thanks!! Our family of five had a great stay! Ed was always prompt and helpful, and check-in was a breeze. There is a ton of stuff within easy walking distance, and Pearl Street is a reasonable walk or short drive away. Flatirons and Boulder Creek are also nearby (by car). We cooked a lot while we were there, and the kitchen was well equipped with everything we needed. We also made good use of the grill and large front yard. Highlight was the basement - great setup for families! Our kids loved the ping pong table and ample selection of board games and movies. We missed in the house description that there is no washer or dryer available, but there is a laundromat a couple of blocks away. Overall I would highly recommend staying here. Many thanks to Ed and his wife for sharing their home with us - it really helped make for a great family vacation! The owners have created a lovely and inviting space, and we appreciated the many thoughtful touches throughout the home. The location is very convenient, and the owner was easy to work with. Quiet neighborhood, near downtown, close to several restaurants, a grocery store, coffee shop, rec center and the foothills. MAXIMUM OCCUPANCY – The maximum number of guests is limited to eight (8) persons. An additional charge or $10.00 per person per night for guests in addition to eight (8) will be assessed. NO DAILY HOUSEKEEPING SERVICE – While linens and bath towels are included in the unit, daily maid service is not included in the rental rate.